A new photographic portrait of The Queen and The Duke of Edinburgh has been released to mark their 70th wedding anniversary. Big anniversaries call for new portraits, and this new one for their platinum wedding anniversary is full of symbolism. 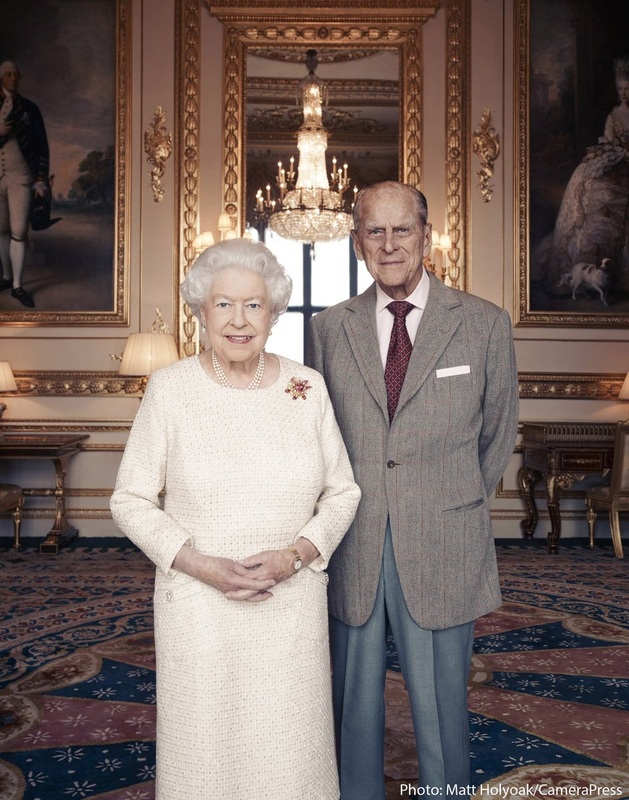 The Queen and The Duke of Edinburgh are pictured in the White Drawing Room at Windsor Castle, between Thomas Gainsborough's 1781 portraits of King George III and Queen Charlotte, who were the British royal family's previously longest married couple with a marriage of 57 years. The photograph was taken by Matt Holyoak of Camera Press, the agency that handled the Baron photographs of their wedding in 1947 as its first assignment. The Queen wore this cream day dress by Angela Kelly to the service held for their diamond wedding anniversary. Her brooch, by jeweler Andrew Grima, was a gift from Prince Philip in 1966. Press for the photo refers to it as the "Scarab" brooch (around here, we have simply called it the Grima Ruby Brooch). Update: The rest of the set was released on Sunday, this time with the platinum couple posing in front of a platinum background. And with smiles!